Earlier this year, we followed Chacoda into the water, thanks to his special ability to wear a GoPro harness. 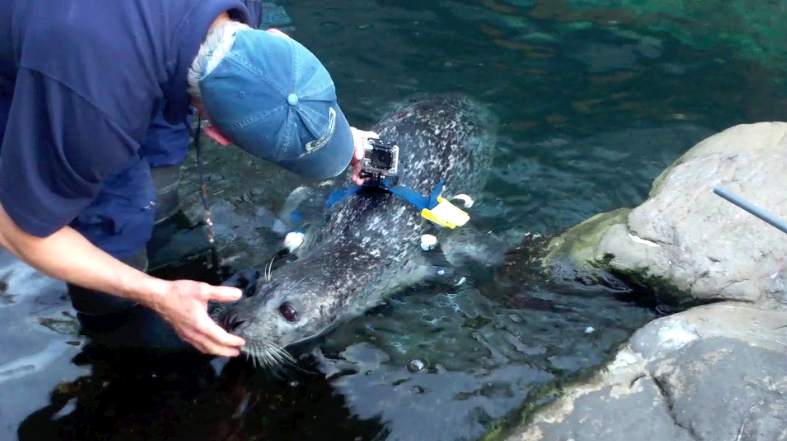 The harness fits around his front flippers and a critter cam sits snug on his back. 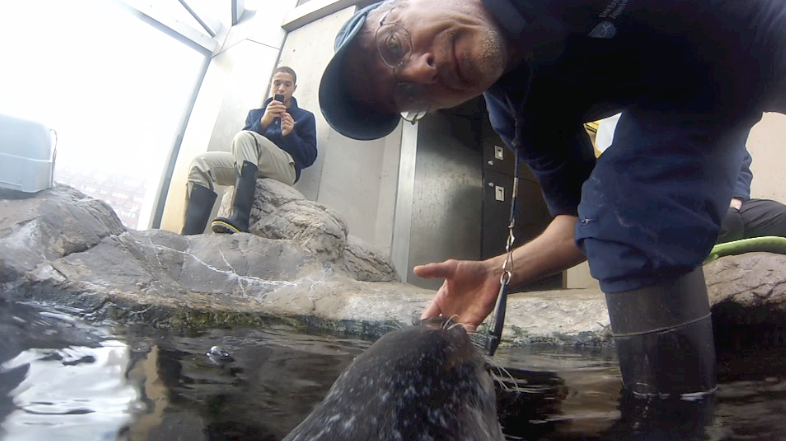 Chuck (as he's affectionately known in these parts) and Paul worked together for some time so this handsome harbor seal could learn to wear the harness while swimming and diving around the exhibit. This skill gives us a special opportunity to see what it's like to effortlessly navigate the habitat in this Front Plaza exhibit and even spring out of the water during a training session! Today's cool video shows us both sides of that story: the traditional above-water perspective of trainers in the exhibit and below the water from Chucky's point of view! Take a look. Not only does this skill of Chacoda's provide a fun way to explore the exhibit underwater, learning new skills such as wearing a harness is a good way to keep this harbor seal active both mentally and physically. Trainers also teach seals behaviors that can help with their medical care, such as opening their mouths for tooth brushing or presenting a flipper so a vet can examine it or draw blood. Come by to see the harbor seals in their Front Plaza exhibit. You'll have new appreciation for the agility and abilities of these athletic harbor seals! Here's a picture of the previous incarnation of the critter cam—so big! Have a question for the trainers? Send it to them in the space below. The moderator will share the question. View all video posts on one page.